Today is fat Tuesday, Mardi Gras, the final day of Carnival as Ash Wednesday tomorrow marks the beginning of Lent. We frequently arrange to have a king cake delivered up from NOLA but didn't realize the day was coming up until it was too late to order one. Oh well! So instead we had to settle for a cherry cheesecake from the Vienna Bakery in Barrington, RI, one of our favorite and most frequented bakeries thanks to all the folks who work here and live in Barrington. 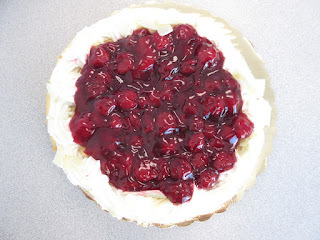 View from the top showing cherries held back by the whipped cream. 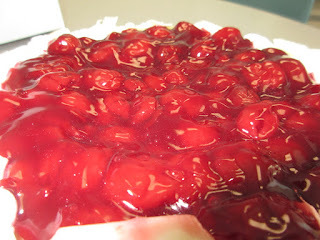 The cake looked great with a nice pool of cherries surrounded by whipped cream and white chocolate shavings. The cheesecake was classic New York style - dense but not too heavy. 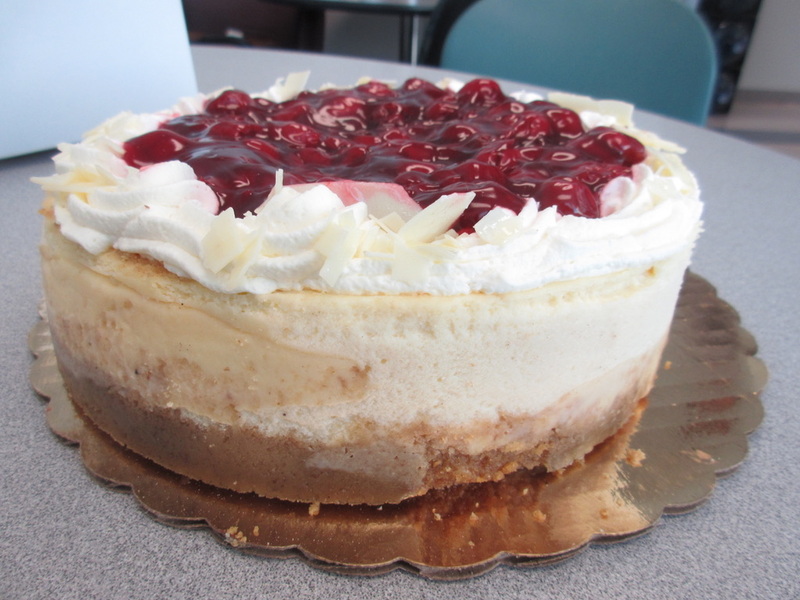 Cherry cheesecake is probably one of the best and this was no exception. 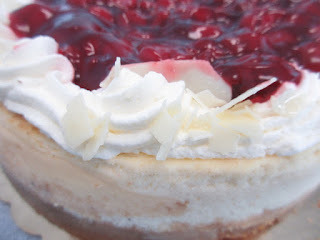 It was creamy and not too sweet and very well received since many who were there happen to be very fond of cheesecake. 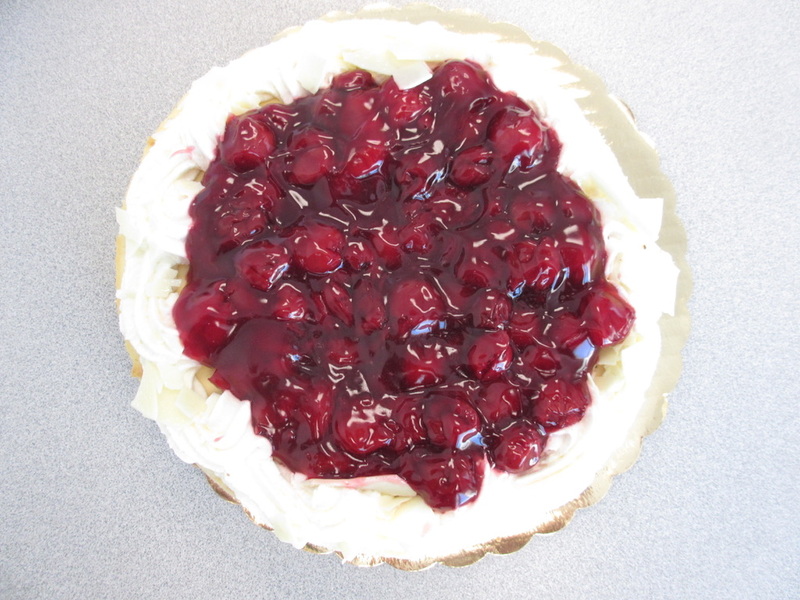 Cherries and cheesecake go well together! Whipped cream and white chocolate finish! 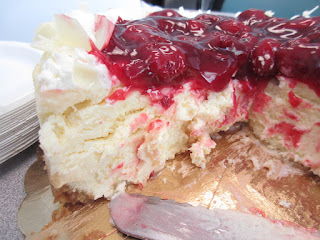 Classic New York style - thick layer with the fruit on top! Mardi Gras prompted a little discussion about religion but nothing too serious. A colleague from China explained how Mao was made out to be godlike only to die and burst the bubble of his immortality. Wondering if this was similar with Jesus Christ but it was pointed out that Christ supposedly came back so he didn't disillusion quite the same way. As a matter of fact that return is celebrated in another 40 days when it is Easter!